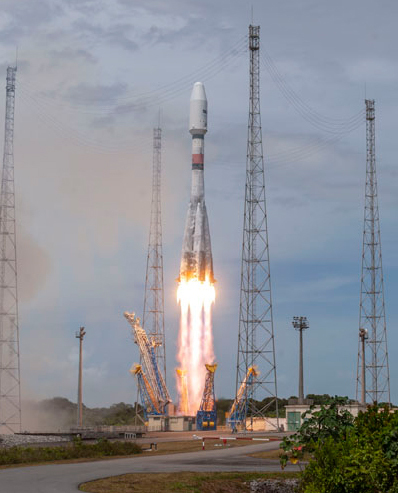 With a successful Soyuz launch that completed the first phase of SES’ O3b constellation, Arianespace today reaffirmed is ability to support the growing global market for such in-orbit satellite systems. Lifting off mid-day from the Spaceport in French Guiana, the workhorse launch vehicle delivered the 17th, 18th, 19th and 20th O3b satellites into a circular orbit during a flight lasting 2 hours and 22 minutes until final separation. Total payload lift performance was estimated at 3,198 kg. After an initial powered phase of Soyuz’ three lower stages, the flight – designated VS22 in Arianespace’s numbering system – included three burns of the Fregat upper stage to place its passengers at their targeted deployment point. 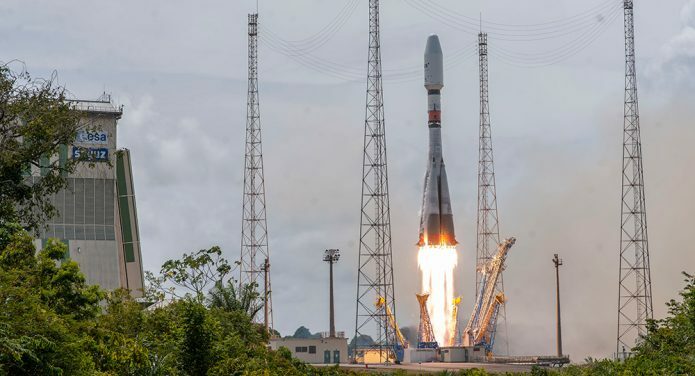 Arianespace’s second Soyuz mission in 2019 was performed from the Spaceport’s ELS launch complex. The O3b fleet of medium-Earth orbit (MEO) satellites – part of SES’s bold vision of connecting people and empowering them with opportunities – is a proven non-geostationary constellation that provides commercial broadband services today, delivering carrier-grade services. Operating at an altitude of approximately 8,000 km., it serves customers in nearly 50 countries. Including the four O3b satellites orbited on Flight VS22, Arianespace has launched a total of 61 spacecraft at the service of SES. 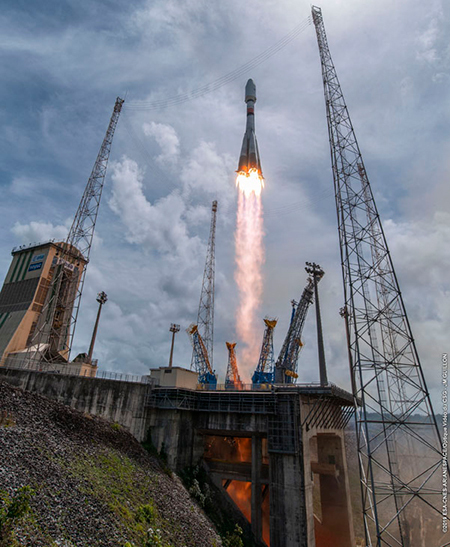 Arianespace’s Flight VS22 marked the 22nd Soyuz mission performed from the Spaceport in French Guiana. By increasing the O3b constellation’s size from 16 to 20 satellites, the SES Networks business unit of SES will offer enhanced coverage while providing greater service availability and reliability – responding to increasing demand for bandwidth from governments, as well as the telecom, cloud, maritime and energy markets. Since 1999, Arianespace has deployed a total of 113 constellation satellites (87 commercial and 26 institutional) for telecommunications and connectivity, Earth observation and navigation applications. The company’s current launcher family – comprising the heavy-lift Ariane 5, medium-lift Soyuz and lightweight Vega – is perfectly suited to launching innovative space systems. Ariane 6 and Vega C, Europe’s next-generation launch vehicles, also will offer the flexibility needed to meet evolving customer requirements. Today’s success is the fourth of Arianespace’s missions targeted for 2019 using its full launcher family, and the second this year with Soyuz. Flight VS22 continues the busy mission pace for the company, which has now performed a total of nine launches in a six-month span (beginning with Ariane 5’s October 19 launch that sent BepiColombo on its way to explore Mercury). Read the press release on Arianespace’s launch of the O3b satellites. High-resolution photos, posters, along with the Flight VS22 liftoff video, are available in the Gallery.